Species profile prepared by A. F. dos Santos. Phytophthora frigida Maseko, Coutinho & Wingfield was described in 2007 in South Africa causing collar and root rot on eucalyptus (Eucalyptus smithii R. T. Baker) and Acacia decurrens Willd. (Maseko et al., 2007). Alves et al. (2016) reported P. frigida causing gummosis on black wattle trees (Acacia mearnsii De Wild.) in southern Brazil. The symptoms are necrotic lesions with or without exudation, that are localized in the basal region of the trunk. In Brazil, besides P. frigida, gummosis has also been associated with P. nicotianae Breda de Haan and P. boehmeriae Sawada (Santos and Luz 2007, Santos et al. 2006). In South Africa, gummosis is associated with P. nicotianae, P. boehmeriae and P. meadii McRae (Roux and Wingfield 1997). Etymology: The name ‘frigida’ refers to the cold tolerance of this species. Noncaducous sporangia showing ovoid shape and papillate condition (Courtesy T.C.A. Alves). P. frigida produces sporangia abundantly in 10% nonsterile soil extract when grown under constant light. Most sporangia have prominent papillae. Most isolates have persistent sporangia formed singly or in a loose sympodium. The sporangial shape is predominantly ovoid, although there are other shapes such as globose, ellipsoid, and obpyriform found in some isolates, including some distorted shapes. The dimensions of sporangia range from 29 to 71 × 20 to 53 μm (avg. 46 × 33 μm), with length-breadth ratios of 1.3 to 1.5 (avg. 1.4). P. frigida produces terminal or intercalary globose chlamydospores that measure 21 to 55 μm in diameter (avg. 32 μm). P. frigida is heterothallic. Oogonial diameters range from 22 to 37 μm (avg. 30 μm). 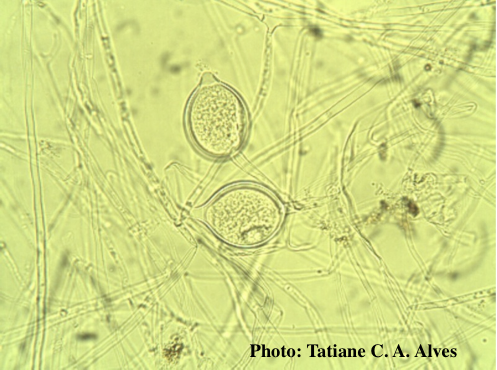 Antheridia are amphigynous and oospores are globose, aplerotic, and 18 to 31 μm (avg. 24 μm) in diameter (Alves et al., 2016). Left: globose chlamydospores. 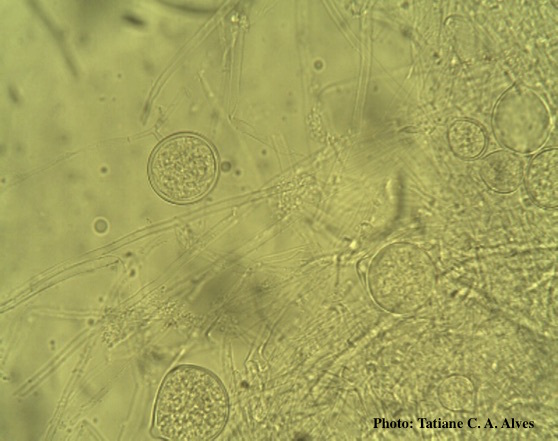 Right: oogonium and oospore with amphigynous antheridium (Courtesy T.C.A. Alves). Phytophthora frigida is placed in Clade 2 (Kroon et al., 2012). 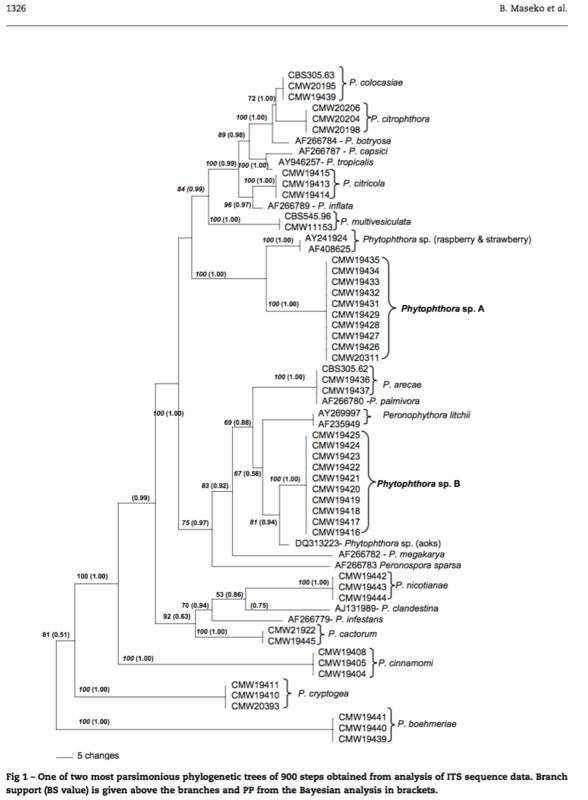 A phylogenetic tree from Maseko et al (2007) is shown. Phylogenetic tree from Masenko et al. 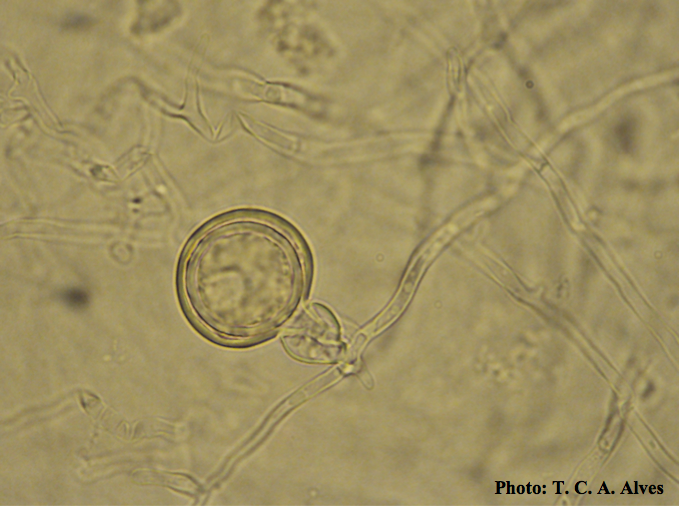 2007 (Phytophthora sp. A = P. frigida). Cultures of P. frigida on carrot agar medium exhibit colonies with dense aerial mycelium. Five different colony patterns have been observed: stellate, cottony, petaloid-to-cottony, slightly stellate, and slightly rosaceous (Alves et al., 2016). The colony growth rate of P. frigida isolates on carrot agar medium is 12 mm/day at 24 to 30°C (Alves et al., 2016). 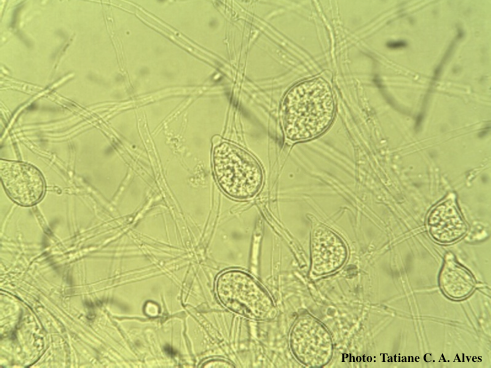 Phytophthora frigida is not easily distinguished from P. nicotianae by morphological characteristics, because both produce papillate, persistent, ovoid sporangia, and are heterothallic with amphigynous antheridia. Many isolates of P. frigida may have been classified as P. nicotianae until 2007, since the occurrence of this was long associated with gummosis in black wattle (Alves et al. 2011). They can be separated by molecular analysis of the ITS region, putting P. frigida in Clade 2 and P. nicotianae in Clade 1. Phytophthora frigida can be distinguished from P. boehmeriae because the latter is homothallic, produces deciduous sporangia with short pedicels (<5 um), and does not grow at 32oC (Santos et al., 2006). Phytophthora meadii differs from P. frigida because it produces deciduous sporangia on medium-length pedicels (18 μm) (Gallegly and Hong 2008). For more information about Phytophthora frigida, visit our Disease, Education and Management materials, and Reference sections.